Reflections on the Popular Assembly of the Peoples of Oaxaca by a North American anarchist who visited the city two years after the rebellion. I arrived in Oaxaca in the fall of 2008. In between the child beggars, the French cafés with English menus, and the native women stuttering invitations to tour the ruins of Monte Alban at the flocks of wide-eyed gringos being herded this way and that by their guides, there persisted the markets selling fried grasshoppers and fermented corn drinks; the way that enclaves of recent arrivals from the countryside nearly tripped over each other in celebrating the fiestas of their hometowns' patron saints with closed streets, brass bands, fireworks, and potlaches of mezcal; the love people felt their city's gnarled ceiba trees – a love which was so strong that when developers attempted to clear an abandoned lot overgrown with vegetation they were forced to do so at four in the morning out of fear of the neighbors – but were still confronted by an angry, easily awoken crowd that captured 56 mechanical saws as prisoners of war. Or the fair atmosphere that overtook the city square each time the teachers had a sit-in, when the plaza was invaded by vendors selling corn on the cob, aguas frescas, alebrijes, jewlery, bootleg CD's, and imitation name brand pants; while reggaeton and merengue blasted from some stalls, others would display a wide variety of bootleg documentaries – The Corporation and The Fourth World War, movies about Emiliano Zapata, the Zapatistas, Che Guevara, Adolf Hitler, Tyrannosaurus Rex, the war in Iraq, the occupation of Palestine, the massacres at Tlatlelolco and Acteal, the anarchist militias of the Spanish Civil War, more titles relating to the city's anti-government rebellion of two years' previous than I could possibly count – stalls where people crowded around television sets like the World Cup had come two years early, requesting to view part of this documentary or that. Even on normal days in the square, full of old men spending their twilight years on a sunlit bench, young boys flirting with young girls, and stray marimba players who could be heard half-heartedly playing traditional tunes, women would intersperse the artisan wares that they hawked to the tourists with pieces of notebook paper bearing political slogans. We Are Continuing To Resist! – the last referring to a belief which held that just as the Revolution of 1910 came precisely on the hundredth anniversary of the War of Independence, so the cyclical nature of Mexican time would be proven to be more than metaphor once again. However, Oaxaca also had a sophisticated style of stenciling and wheatpasting that engaged with Mexican history and culture in a way rarely seen in graffiti. In Oaxaca you could see a mural re-enacting the street battles of 2006, riot cops raising their truncheons over the bodies of prone citizens who have red paint splashed 'round their skulls and the words OAXACA – REPRESSION repeated behind them. Two blocks away was Frida Kahlo with a rifle strapped to her back, and if you followed the same street up the hill you could find Emiliano Zapata sporting a mohawk. Wrapped around the corner of a door frame downtown was a depiction of a young man spray painting a portrait of the 19th century Zapotec president Benito Juarez, and Lucio Cabañas cradled his machine gun underneath a window on a little-used side street. One of the most famous yet most elusive was the Most Blessed Virgin of the Barricades, who wears a gas mask as she prays and in whose shawl is stitched a pattern of burning tires. So I was surprised to see red flags bearing the hammer-and-sickle carried in marches, and rallies where laminated paper icons depicting the holy succession of Marx, Engels, Lenin, and Stalin were reverently displayed in front of the stage. And though the spirit of the Zapatista Councils of Good Government have often been invoked in describing the spirit of self-management in Oaxaca over the course of 2006, I attended a rally two years later where activists who publicly advocated an electoral boycott were struck with red flags by enraged communists. Something more complicated had happened here than I had been let on to. We must back up a bit in order to understand the events that shook Oaxaca during 2006. In the aftermath of the Zapatista rebellion of 1994, the government of Oaxaca was preoccupied with preventing the spread of armed struggle into their state. They had reason to worry. To name a few examples among many, in 1977, an unpopular governor had been dislodged by a student movement in the capital. In 1979, the local section of the government-controlled teacher's union broke away from its national organization in a rank-and-file rebellion and began a tradition of annual strikes. After nearly a decade of organizing land seizures and road blockades, in 1981 the Worker-Peasant-Student Coalition of the Isthmus (COCEI) won the municipal elections in Juchitán, making that town the first to be governed by leftists since the revolution, an honor they still held in 1994 despite a four year military occupation in the mid-80's. In 1983, indigenous communities in the Sierra Norte regained control of their forests from timber companies, and have since then managed them as cooperative, sustainable enterprises. Sparked by experiments in Juchitán and the Sierra Norte, a movement of community-controlled radio stations spread throughout the state and eventually the country, offering critical and often radical analyses of local events. And when the government expropriated coastal farmland in Huatulco for a tourist development in 1984 and killed peasants who refused to move, it caused such resentment that as if to fulfill the government's worst fears, guerrillas from the Revolutionary Popular Army attacked the town's tourist agency in 1996, leaving nine dead. 1 Oaxaca was a state of revolt. In 1995, teachers were expelled from the autonomous Zapatista communities. The education offered by the Mexican school system has been tailored to serve children living in cities who dream of working either as professionals or in one of Mexico's coveted union jobs – for children living traditional lifestyles in rural communities, it does little more than maladapt them to their surroundings and ends up as yet another factor encouraging the migration that has been depopulating the Oaxacan countryside. Benjamin Maldonado, who has studied extensively the relationship between indigenous people and the state, has said that “for me, it's very regrettable, very sad, to see a Mixtec man who is technically qualified that doesn't have the least idea about how to heal his children, that doesn't know what plants to use for which types of cures. In place of turning to their maternal knowledge, that of their own culture, in the case of illness they turn to a doctor, in construction to an architect, in money to a bank, in place of turning to their community...what school generates is the disintegration of the community.” 5 Due to its lack of practical application, one of the main functions of education in southern Mexico has been to forge the imagined community of the Mexican nation out of the living communities of Triqui, Huave, Chontal, Mixe, and Zapotec peoples, and to enforce the use of spoken Spanish in place of the indigenous languages it denigrates as mere 'dialects.' It is therefore no surprise that indigenous leaders have frequently denounced the Mexican educational system, comparing its role in their communities to the one played by missionaries during the Spanish Conquest. Section 22, despite its origin in a rank-and-file rebellion against the hierarchical structures of the national teacher's union, suffered the same fate as many opposition groups in Mexico, in that it came to resemble the very things it hoped to fight. The same faction had controlled the union since the early 1980's, and just as the national union used the carrot and the stick to enforce loyalty to the Institutional Revolutionary Party, Section 22 applied the same methods to their members to ensure high turnout at their rallies. Their undemocratic structure has led to internal grumbling – many within the union, while still supporting many of the section's demands vis-a-vis the national organization, often wonder if Section 22's local bureaucrats are any less concerned with power than their counterparts in Mexico City, as well as what the Marxism-Leninism often spouted by section members has to do with higher wages. So when the leaders of Section 22 saw the outpouring of support by the citizens of Oaxaca during the police attack, it quickly sought to capitalize on the situation for its own benefit. Soon after June 14th, the union convoked an assembly of organizations that they hoped would declare themselves in solidarity with their strike, but were unprepared for the turnout of uninvited guests. The rage of the people of the city ran deeper than one confrontation with the authorities, and the teachers found themselves but one voice among many. Everyone had different grievances and different ideologies, but all could agree on one thing: Governor Ulises must go. It was a demand both broad enough to rally diverse groups behind it, as well as a realistic one, as there were multiple precedents in Oaxacan history of when a governor had been forced down by a popular movement. A constitutional provision states that if an executive is incapable of maintaining a state of governability, new elections must be held – and after a thirty-member Coordination Committee was chosen, Oaxacans set out to prove just how ungovernable they are. The Popular Assembly of the Peoples of Oaxaca (APPO) was born, and a strategy of disrupting the government's work by occupying state buildings was decided upon. Some groups who wished to use APPO for their own ends, typically Marxist-Leninist organizations like the Popular Revolutionary Front (FPR), began to dominate the assembly's meetings. The FPR, which has its strongest base of support in the rank and file of the teacher's union, made up for their lack of numbers in their ability to talk nonstop. Meeting attendance dropped drastically as a result, and those who stuck it out at committee meetings found most of their energy used up in endless arguments. 9 In the end, the only decisions made by the Coordination Committee that had any impact on the rest of the movement were the dates they fixed for marches – for the most part people acted autonomously, either as part of an organization that made its own decisions, as part of an informal neighborhood committee, or by themselves. One of the most famous actions taken during the movement – the occupation of the state owned television station and its conversion into the women-run Cooking Pot Channel – was planned and carried out entirely outside the consultation of the Coordination Committee. The march ended up at the state-owned television station, and some of the demonstrators suggested that they demand the microphone in order to counteract the media's misrepresentations of the movement. When they were refused, a brief meeting was held and it was decided to take over the station, which was promptly conceded to them without a fight. “People began to arrive from the communities, from the mountains of the north, from the mountains of the south, wanting to talk about what's been happening in their communities, to denounce the government,” Concepción recounts, and so they were given their own program. 12. Kiado, himself an independent journalist for the Oaxaca Libre website, says that for him, the most important moment of 2006 was when he returned home to his community in the Sierra Juarez and he saw the women there watching the women of Oaxaca on television, as it opened up new possibilities of what women are capable of that had been hitherto unthinkable. 13. It was around this time that indigenous communities began to participate in the movement in large numbers. While some indigenous organizations, such as Services of the Mixe Peoples, had been present from the meeting that founded APPO, many more had been tentative at first, wanting to make sure that the movement represented something more than the self-interested demands of the teacher's union, whom they mistrusted. By early August, they had been convinced.14 Yet even with the greater participation of people from rural areas, the movement largely remained confined to the city. “The people have always been going down to the city of Oaxaca. From the first Megamarch on the afternoon of June 14th, there were two brass bands from the Sierra,” Kiado recounts, while lamenting the absence of a flow in the opposite direction. “Section 22 sometimes orders the teachers to march in the mountains, march on the coast, but it's not the same as an initiative of the people.” Kiado claims that two years later, little work has been done to address this problem – although he also points out that people only began to reflect seriously on their experiences in the movement in 2008, because during the movement everyone was too busy to think, and 2007 was a year that was used for, more than anything else, rest and a chance to catch one's breath. The federal government was initially reluctant to respond to the crisis in Oaxaca. But it was an election year, and the country was in the middle of a presidential succession crisis when left-center candidate Andres Manuel Lopez Obrador contested the results and mobilized his supporters behind him for a campaign of civil disobedience, demanding a recount. While outgoing President Vicente Fox constitutionally had the power to remove Ulises Ruiz Ortiz from office and defuse the situation, as had been done many times in the past, his party's candidate, Felipe Calderon, needed the support of the Institutional Revolutionary Party (to which Ulises belonged) in order to maintain his claim to the Presidency. And so on October 29th, the Federal Preventative Police (PFP) arrived in Oaxaca, putting the city under what amounted to a military occupation. The downtown core was soon controlled by the federales, but when they tried to capture Radio Universidad on November 2nd, they were confronted by barricader@s who had armed themselves with slings, fireworks, and Molotov cocktails. On November 25th, a megamarch was organized to demand the withdrawal of the PFP from Oaxaca. Anger had been mounting as women were beginning to come forward with stories about being raped by the federales. However, the march organizers decided to designate 200 peacekeepers in order to defuse any potential altercations with the police, in spite of the successful example of resistance earlier that month. When the march reached the city square, violence broke out. Some say the police started it, some have blamed agent provocateurs, some have blamed unfocused rage. But street fighting soon broke out across downtown, from the first class bus station in the north to the Periferico thoroughfare in the south. When 2007 came around, the movement no longer existed, at least in the streets. The First State Congress had been scheduled for February of that year, and was to provide a forum for the reorganization of the shattered rebellion. However, before the assembly began, several organizations within APPO – including the Popular Revolutionary Front, the Broad Front for Popular Struggle, and the New Left of Oaxaca (Flavio Sosa's organization) – had opened negotiations with several left-leaning political parties and offered up a list of APPO candidates for the elections coming up later that year. When the rest of the assembly found out what had happened in their name and without their consultation, there was a great deal of anger. According to David Venegas, many of these groups had little influence while the rebellion was in progress, in part because they were internally corrupt and had rigid internal hierarchies, but they were able to survive the repression relatively intact and subsequently hegemonize the movement and its memory after its defeat. By contrast, the organization of people in the barricades, while egalitarian and community-based, was internally weak and collapsed after the 25th of November. 37 After the repression hit, the movement's center of gravity shifted away from ordinary people. But to draw attention to this situation is not to engage in sectarianism. Many people have embraced the heterogeneity of APPO, pointing out that it can only be as such, mirroring the nature of city life. 38 “The ideological diversity of our movement reflects the diversity of our state,” said Venegas. “Of our mountains, our rivers, our jungles, our eyes.” The problem was a basic difference in political philosophy – one side of the movement that criticized the bad management of Oaxaca by the Institutional Revolutionary Party and who thought that they could do a better job, and another that was influenced by ideas of autonomous social organization and the anti-electoral politics of the Zapatista's Other Campaign, who felt that APPO was the first step towards implementing a democratic assembly of the people as the new political paradigm for Oaxaca, modeled after those in indigenous communities. Even some of those who sided with the latter group, believing an assembly to be a positive long-term goal, argued that it would be impossible to implement such a project under Ulises Ruiz Ortiz, and that friendly politicians must be put in office in order to give the movement room to maneuver. At this time, many of the movement's participants who were opposed to the electoral path, David Venegas, Ruben Valencia, and other veterans of the Brenamiel barricade among them, formed an organization called Oaxacan Voices Constructing Autonomy and Liberty (VOCAL) – a grouping of Zapatista sympathizers, Magonistas, anarchists, barricader@s, and those “who worry about about keeping our social movement faithful to its principles, autonomous and independent from political parties and restoring the assembly model.” 39 A tactical alliance between two such groups could not last for long, especially as members of the FPR had begun making ungrounded public insinuations that members of the anti-electoral bloc, particularly David Venegas, were police agents. Nevertheless, unity was maintained for the time being by means of a compromise. The consensus reached was that APPO would not participate in the electoral process, but neither would it call for an electoral boycott or prevent any of its members from running provided that they resigned from APPO. A diversity of strategy was to be respected. The only condition was that no one was allowed to use their connections to the movement to further their political campaign – a condition that once agreed to, was subsequently ignored by every candidate. But as the movement in the streets no longer existed, there was no way to keep these would-be representatives accountable to their base on even this issue, something that bodes ill for their future political careers. David Venegas was arrested five months before the elections, and after being held and tortured in an undisclosed location, he was transferred to Santa Maria Ixcotel Prison and accused of drug possession. On April 15th, a march was organized demanding his liberty – but early that morning, Guadalupe García Leiva, the same woman who had accused him of being a police infiltrator at the First State Congress, had falsely announced that he had been released with the intent of canceling the demonstration behind everyone's back. A month after his arrest, a letter was smuggled out of Ixcotel where Venegas wrote that “it has been difficult for me to denounce these acts before this moment...(but) within the political current in APPO that looks for the conquest of power through elections exist as well some men and women more harmful and despicable that do not differ in their political practices in the absolute from the criminals that are in power today...specialists in the deliberate omission, the lie, and the simulation...they have learned to talk the same language as the government.” 40 David Venegas was imprisoned and tortured for one year – a stark contrast to the fates suffered by members of the electoral bloc who had the misfortune to be arrested. Flavio Sosa was in jail from December 2006 until April 2008, but he represents the exception more than the rule. 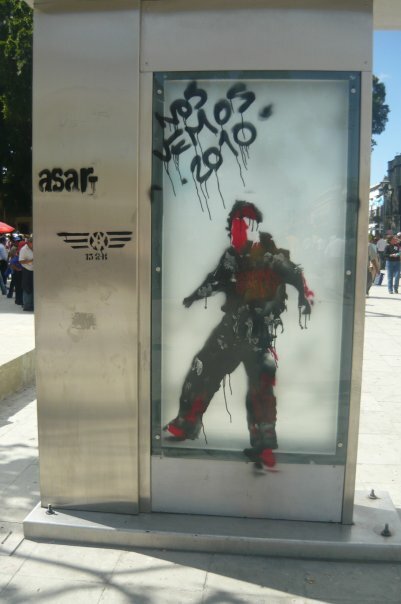 For example, one time when the FPR militant Florentino López Martínez (who participated in the attacks on Venegas) was detained by the police he was almost immediately let go when the officer in question “received superior orders.” 41 For all the ink that has been spilled since 2006 about repression in Oaxaca, little has been said about how selective it is. Voting is not a threat to a government like Mexico's which has no scruples about falsifying election results, and it is therefore not a coincidence that one of the strongest voices speaking against electoral participation by the movement was imprisoned in the months leading up to the elections. A spokesman for Section 22 also denounced the same acts of “provocation” as the FPR – and the government concurred, with Subsecretary Joaquín Palacios ranting against the “goths, punks, gangbangers, bums, and vandals in general that are the scourges of our neighborhoods,” whom he contrasted to the law-abiding teachers. 44 This is a distinction that never would have been made two years previous, when the peaceful sit-in of striking teachers was attacked by the police early that fateful June morning, when the government operated under the slogan 'neither marches nor sit-ins.' But the course of the popular rebellion that resulted in 2006 revealed that the teachers were far from the most radical element of Oaxacan society – their struggle was merely the lightning rod that focused the energies of the people, but these energies frightened many of those who owed their job to the need of the government to have intermediaries between them and the teachers, as can be seen by the decision to end the six-month strike by higher-ups within Section 22 in November 2006. It is in this context that one must understand the readiness of government officials to (at least temporarily) grant legitimacy to the teacher's movement, in an attempt to draw them back into the establishment fold and divide the larger Oaxacan movement. Concepción Nuñes believes that the upcoming state congress in February 2009 will decide whether or not APPO has a future or not. 50 Cosmes, a Oaxacan anarchist who teaches free screen-printing classes, is more skeptical, explaining that meetings of the assembly are often convoked, but nobody knows by who. It could be a legitimate congress, he says, with all the different factions and representatives that make up APPO, or it could be a sectarian gathering of the FPR, COMO, and not a whole lot of anyone else. 51 To my outsider's perspective, APPO is seeming more and more like a corpse being fought over by the people of Oaxaca than an organization that expresses their will. This is not to say that nothing is happening in Oaxaca, but that the political projects being pursued by the different groupings that made up the assembly often have little to do with each other, while each one makes sure to emphasize their connection to the 2006 rebellion. But this cannot be an amicable parting of ways between two groups that have chosen different political paths as long as the state continues to practice selective repression against some factions while attempting to draw others back into its fold. On the morning of December 8th, 2008, shortly after the fight broke out at the Megamarch and a week before I was to leave Oaxaca, I made a visit to the Autonomous Oaxacan House Supporting Self-Managed Work (CASOTA). The collective had been created earlier that year by people associated with VOCAL to provide a place to encourage economic autosufficiency. Cosmes uses it as a place to give his screenprinting courses, others teach bookbinding and urban agriculture, and the building also houses an electronics repair shop and a community kitchen. I had come to the collective do a final set of interviews before I left town. When I got there, the windows were broken. Through a crack in between the boards covering the front door I could see a pile of furniture stacked up on the other side, and I was waved around to a side entrance. It turned out that the night before a compañero who was passing by to drop some things off while on his way home from a party had been harassed by the police in front of CASOTA. They searched his bag for drugs (finding only radio equipment) and beat him with their truncheons, all the while shouting “Why aren't you hitting back?” 52 The police then began breaking windows and launching tear gas canisters into the collective's courtyard in an attempt to provoke violence that they were hoping would work to discredit the anarchist faction of the movement. 3. Gustavo Esteva (2008). The Oaxaca Commune and Mexico's Autonomous Movements. Page 11. Oaxaca de Juarez: Ediciones ¡Basta! 4. Benjamin Maldonado Alvarado (2002). Autonomía y Comunalidad Indígena. Pages 110-111. Oaxaca de Juarez: Book Published By Author. 5. Benjamin Maldonado Alvarado, Gustavo Esteva, and Marcos Sandoval. Reforma Educativa: Atreverse a Pensar. Suplemento Catorcenal no. 13, Opciones July 10, 1992. 8. David Venegas, interview with author, November 13th, 2008. 11. John Gibler, Mexico Unconquered: Chronicles of Power and Revolt. San Francisco: City Lights Books. Page 154. 14. Gustavo Esteva, op. cit. 19. Bonfil Batalla, Guillermo (1987). México Profundo: Una Civilización Negada. Miguel Hilado: Grijalbo. 20. Lapierre, George (2007). La Comuna de Oaxaca: Mito o Realidad. La Guillotina 56: 18-23. 22. El Alebrije (2007). Las Noches en la Ciudad de la Resistencia. In La Batalla Por Oaxaca. Page 201. Oaxaca de Juarez: Ediciones Yope Power. 27. Silvia (2008). Students and neighbors at the barricade defend Radio Universidad. In Teaching Rebellion: Stories from the Grassroots Mobilization in Oaxaca. Diana Denham and CASA Collective, eds. Page 203. Oakland: PM Press. 28. El Alebrije (2007). Las Noches en la Ciudad de la Resistencia. In La Batalla Por Oaxaca. Page 200. Oaxaca de Juarez: Ediciones Yope Power. 29. Paul Perez Sampablo, op. cit. 31. Victor Raúl Martínez Vásquez (2007). Autoritarismo, Movimiento Popular, y Crisis Política: Oaxaca 2006. Pages 162- 163. Oaxaca de Juarez: Universidad Autónoma Benito Juárez de Oaxaca. 33. Paul Perez Sampablo, op. cit. 35. Nancy Davies (2007). The People Decide: Oaxaca's Popular Assembly. Pages 186-187. New York: Narco News Books. 37. Interview with author, November 13th, 2008. 44. Pedro Matias. Culmina Megamarcha en Batalla Campal. Noticias, November 25, 2008. 52. Jennie Renn, personal communication, December 10th, 2008. The APPO two years on: Where now for Oaxaca's social movement? Excellent survey of the background events! However, the PFP arrived in Oaxaca on October 27th, not the 29th. Regarding the role of the teachers in the fracturing of la APPO, there was some kind of provision that all of the new teachers would lose their jobs if the teachers didn't go back to work when they did, nonetheless many teachers wanted to remain in solidarity with the rest of la APPO, and felt that their union leader who signed the agreement had sold them out. Even after the teachers went back to work, the government continued to punish them and on certain days closed school early and sent students home while they entered classrooms and detained various teachers whom they had determined had played important roles in the strike and aftermath. The insight that “urban spaces in their immense majority are...those where indifference as a form of relation between neighbors predominates" and the critique of the lack of pragmatism in education apply here in this country as well. I was present in Oaxaca in 2006 and also when you were there, and like the protagonist in "The Hurt Locker", can't wait to go back and escape the apathy here.